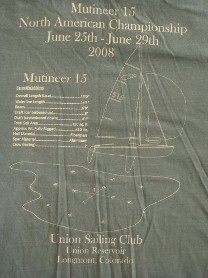 Apollo Beach, Florida – Mutineer 15 Midwinters – Hosted by Tampa Sailing Squadron (TSS) on March 31-April 2nd. Aargh!… A great time had by all. 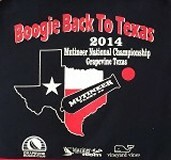 12 Mutineer Skippers and Crew came out to race during the 3-day Midwinter event. 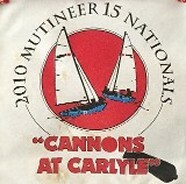 Our teams competed against some of the very best sailors that Fleet 18 and the national Mutineer Class Association had to offer. The winds were very light and conditions were challenging for all competitors. 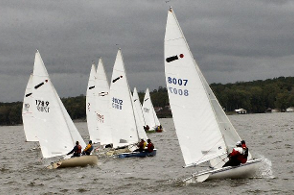 Twelve boats competed in all with 5 boats in the Silver Fleet (non-spin) and 7 boats in the Gold Fleet. Racers of all ages made up the fleet. TSS was especially proud to have two teams of youth sailors competing for the first ever perpetual trophy for juniors. The helpful nature of TSS members and the camaraderie racers and volunteers was second to none. After final boat and sail measuring on Friday morning, the Bal Harbor Poker Run was held on Friday afternoon in a stiff breeze with boats sailing a 4-leg upwind-downwind course where they met a sailboat at the end of each leg that dealt them a card. The final card was given on TSS’ porch. Darin O’Neal in SAM had the winning hand with 3 Aces! He received a race-inspired soft cooler bag, -compliments of Harken. The poker run was followed by a barbeque on TSS’s deck. After a classic TSS breakfast for racers and race committee, Saturday morning began in Tampa Bay with a 1.5 hour postponement flag until the race committee determined winds were steady enough to get the first 4-leg windward-leeward race off. Two additional 4-leg races followed, all with light, shifty winds, forcing skipper and crew to pay attention to the smallest details of sail trim and wind flow to find success. Sunday morning began again with a postponement until the winds filled in. Thankfully the wind gods abided and gave us a 4-leg windward-leeward race followed by a 5-leg race - five races in all for the Midwinters. **Bob Sardo and the entire race committee deserves the accolades that come with providing a first-class regatta. Race Committee was lead by race professional Tim Rumptz. 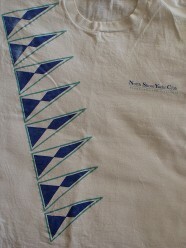 US Sailing’s Judge Ann Newton was on standby to assist. **Tampa Sailing Squadron is known throughout Tampa Bay for it member’s contribution in putting on great, competitive and fun-inspired races along with fantastic food and entertainment venues. **Our New Vice Commodore Matt Dalton deserves a big AARGH! for putting together such a cohesive M15 Midwinter event. 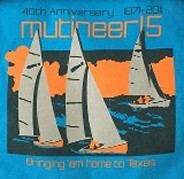 Pat Austin’s vision and Matt’s passion to build the Mutineer class inspires all of us. **Dave Tonkin for working to support and build the Youth Sailing Teams. 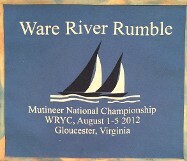 Racing competition was tight in spite of 40+ year old boats competing with newer, Nichols Mutineers. No matter the boat’s age, all Mutineers were well matched for one design racing. The newest 2017 Mutineer [KRAKEN] purchased by Dave Tonkin ran the course along with the others. Following racing on Sunday afternoon, TSS’ Commodore Dan Kresge administered a hilarious ‘ole mariners, rum-centric, ceremony to officially name the boat and ensure a lifetime of safe journeys for the boat and her crew. The boat was duly christened when Dave poured a bottle of KRAKEN rum over the foredeck (some attendees tried to catch the rum as it ran off the foredeck and a few were seen licking the foredeck after the ceremony). As results below indicate, a tough battle ensued both days for the 4 top finishers in the Gold Fleet. Winning Gold and showing us ‘how it’s done’ was Herb Maguire & Ray Matuszak in FOGDOG. Silver Fleet’s winners were Brian Gales and Cathy Martin in KEMOSABE. Unfortunately, Jim and Margaret Davis could not make the racing. Jim Davis did however provide some incredibly cool Mutineer 2017 AND perpetual trophies for the fleet and youth sailors. Thank you Jim! Besides the sportsmanship and professionalism that went into this event, what stands out was the opportunity to see youth sailors competing and ‘newcomers to sailing’ succeeding and beating seasoned-sailors at their game. Congratulations to our two youth sailing teams that competed in the Inaugural Mutineer National Midwinter Championship this weekend! They are prodigies of the new TSS Youth Sailing Mutineer Racing program. 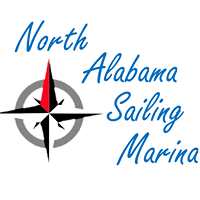 Formed during the fall of 2016 by Matt Dalton and Dave Tonkin, the program is co-sponsored by TSS Youth Sailing and TSS Mutineer Fleet 18 with a goal to give teens from age 13 to 18 exposure to sailboat racing and the Mutineer 15 one design class. Members from Fleet 18 help rig and maintain Mutineers for the youth sailors. 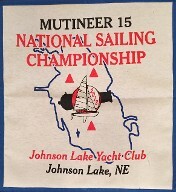 The Mutineer Midwinters is the first major event the youth sailors have competed in from that program. For the Youth Sailors, there was plenty of team spirit on hand as each team created custom t-shirts to cover their life jackets. 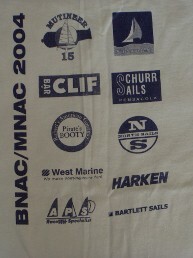 APOLLO 2020 wore red tank tops with their boat name and crew names. THE FORCE had bright neon-green shirts with "Team Force" across the back and hand-drawn artwork on the front. 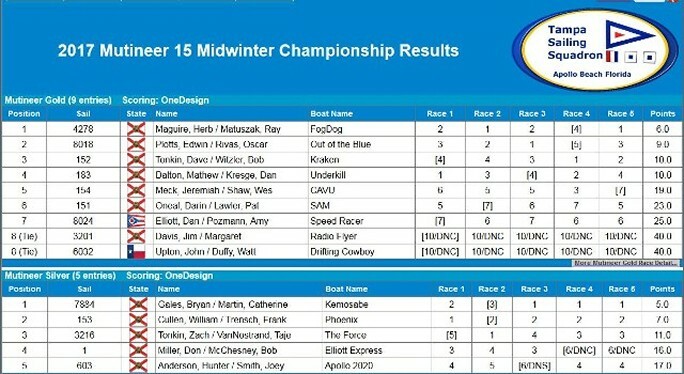 In the end, THE FORCE with Zach Tonkin, Taje Vanosterand and Josh Dankryl were awarded the first-ever Top Junior Team perpetual trophy for the Mutineer National Midwinter Championship series. Their names will be inscribed on the trophy that will be kept in Tampa Sailing Squadron's trophy case for years to come! 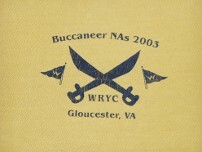 We all want to thank the sailors for dedicating time to practice each Sunday for the past few months and demonstrating great sportsmanship and to parents for encouraging their childs' interest in sailing and for supplying drinking water whenever needed. After sailing for just 8 months, a special AARGH! goes out to newbies Brian Gales and Cathy Martin who showed the Silver and Gold Fleet how to win. KEMOSABE was an early comer at the weather marks and finish lines! Best in their words: “We’re starting to realize the wisdom that some of our mentors have been trying to impart on us for months; every day in a sailboat is an opportunity to learn something. At times the conditions at Midwinters were frustrating, but I think our progression as sailors benefited because of that”. Our Youth Sailors and Newcomers are the key to the future and fun of competitive sailing. Let’s keep building the passion together! Aargh! !